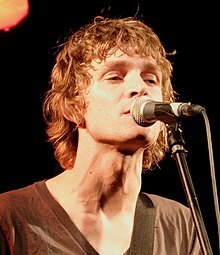 Brendan Benson (born November 14, 1970) is an American musician and singer-songwriter. He plays guitar, bass guitar, keyboard, and drums. He has released six solo albums and is a member of the band The Raconteurs. Benson was born in Royal Oak, Michigan. His debut album, One Mississippi, was released in 1996 on Virgin Records. The album featured several contributions with Jason Falkner and failed to sell in sufficient numbers and Benson was dropped by Virgin. In 2002, the follow-up to One Mississippi was released, Lapalco. Again the critical plaudits poured in, but this time the record enjoyed a certain degree of commercial success, selling more than three times as many copies than that of One Mississippi. The song "Good To Me" from this album appeared on the British show Teachers during series three and was included on the series soundtrack; it was also covered by The White Stripes for the B-side of the single Seven Nation Army. The song "Tiny Spark" featured on an episode from the fourth series of Teachers, as well as in the feature films Along Came Polly, and World's Greatest Dad. While touring this record Benson played the Reading and Leeds Festivals and finished his Leeds set with a performance of the track "Jet Lag" featuring guest appearances from Meg White of The White Stripes along with members of The Datsuns and Soledad Brothers. In 2003 Benson re-released his debut album along with bonus tracks including the unreleased six-track extended play Wellfed Boy EP. In 2003, Benson also released Metarie, with his then band The Well Fed Boys, and which featured a cover of Paul McCartney's Let Me Roll It, which featured back-up vocals by Jack White. This was the first song written completely by another artist to be featured on a Benson release. Another cover, this time "Strong Boy", from Gram Parsons International Submarine Band 1968 album, Safe at Home, was released as a B-side in 2005. In 2005, Benson released his third album, The Alternative to Love, and toured extensively in the US, UK, and Europe with his new touring band, The Stiff Tissues. "Spit It Out" was the first single and reached the UK Top 75 for the first time (peaking at No. 75 in April), and also generated some buzz for Benson. Two further singles were released from the album. "Cold Hands Warm Heart" appeared in many commercials and TV shows and "What I'm Looking For" was used in multiple national advertising campaigns. This album charted at No. 70 in the UK Albums Chart. Benson is a member of The Raconteurs, a collaboration with Jack White, Jack Lawrence, and Patrick Keeler. Benson and White co-wrote the songs. The group's debut album, Broken Boy Soldiers, was released in the US on May 16, 2006, with "Steady, As She Goes" as the first single. Benson worked as a producer for The Greenhornes, The Nice Device, The Mood Elevator (a permutation of The Well Fed Boys), Whirlwind Heat, and the Stiff Tissues member Dean Fertita's former band, The Waxwings. The Raconteurs released their second album, Consolers of the Lonely in March 2008. Benson's fourth album was My Old, Familiar Friend. In March 2007, a handful of demos from Benson's upcoming album were posted on his Myspace. "Feel Like Taking You Home" was the first of these demos to appear. Around the same time the demos of "Forget", "Poised And Ready" and "Go Nowhere" leaked onto the internet. Later he posted more songs on his MySpace including "Lesson Learned", "Eyes on the Horizon", and "Untitled". Dean Fertita, who played keyboards with the Raconteurs on tour and now is with Queens of the Stone Age and The Dead Weather, plays piano on all the Benson demos, with all other instruments played by Benson. In October 2007, two new songs, "Purely Automatic" and "Will it Keep," were published on Benson's official website, presumably finished songs from the album. In November 2008, he uploaded a new song, "Playdown", on his Myspace, but it was quickly taken down. He soon put it back up along with another new song called "No One Else But You". Soon after, the songs "O My Love" and "New Words of Wisdom" were added to his page. Later he added "I'll Never Tell", "Happy Most of the Time", "Only in a Dream" (cover of Young Hines), and "Diamond" on his official MySpace page and he also added "Open Your Eyes" on his Reverb Nation page. In mid March 2009 Brendan put a collaboration with his girlfriend Britt, "The Hunter Gets Captured by the Game" (cover of The Marvelettes) on his Myspace page. On March 18, 2009, KRCW played a new song "A Whole Lot Better" and on May 10, 2009, KRCW played another new song entitled "Garbage Day" both presumably finished songs off his fourth album. The title "My Old, Familiar Friend" and the track list were revealed on June 4, 2009. The album was released on August 18, 2009. My Old, Familiar Friend was produced by Gil Norton according to his MySpace page. He is backed by the Features on some of the record. In late 2008, Ashley Monroe collaborated with The Raconteurs and Ricky Skaggs on The Raconteurs single, "Old Enough", which was released in bluegrass form, and as a music video which was in rotation on CMT. "Hey everyone! I just wanted to write ya a quick note to tell you I have put up some new songs you guys haven't heard. I have been working with Brendan Benson ... who I met on the set on The Raconteurs video shoot... and I am SOOO EXCITED about the music we have been making. I can't wait to share more! The two songs I posted of ours are "The Things I Do" and "Grey"... hope you love them as much as I do!" Benson teamed with Raconteurs touring member Mark Watrous (Gosling, Loudermilk) in October 2010 to release a single as the fictional duo "Midas Well" and "Upton O. Goode". Well & Goode's debut single was a 7" vinyl record and digital download, and featured the songs "Spray Tan" and "Two Birds". What Kind of World was released on April 21, 2012. It was released on his own new label Readymade Records in the USA, and on the indie label Lojinx in Europe. The album was recorded at "Welcome to 1979" Studios in Nashville, Tennessee and recorded entirely in analog. What Kind of World peaked at No. 7 on the UK Indie album chart in the week of release. You Were Right is the sixth studio album released in December 2013 under Benson's own label Readymade Records in the USA, on Lojinx in Europe, and on Dine Alone Records in Canada. The album is the culmination of a monthly singles series recorded in Nashville, Tennessee at Readymade Studios. Readymade Records was announced by Benson in early 2012. The label was started with Benson and Young Hines as the first two signed artists. Benson released What Kind of World in the US on April 21, 2012. The album was released in the UK on April 30, 2012. Young Hines released Give Me My Change in the US on April 10, 2012. "Feel Like Taking You Home"
^ "A matter of Choice". The Irish Times. March 6, 2009. Retrieved March 7, 2009. ^ a b Roberts, David (2006). British Hit Singles & Albums (19th ed.). London, UK: Guinness WorldRecords Ltd. p. 54. ISBN 1-904994-10-5. ^ "Raconteurs Man Resumes Solo Career". Ultimate-guitar.com. Retrieved May 3, 2012. ^ a b "Brendan Benson Launches Readymade". Brendanbenson.com. January 5, 2012. Archived from the original on January 28, 2012. Retrieved November 14, 2012. ^ "Benson profile at". Lojinx.com. April 23, 2012. Retrieved November 14, 2014. ^ "You Were Right". Amazon.com. Retrieved December 12, 2013. Wikimedia Commons has media related to Brendan Benson. This page was last edited on 2 April 2019, at 05:52 (UTC).